We have been having lots of fun making the characters from the Gruffalo during our Forest school sessions. The children have thoroughly enjoyed making their own mud clay to work with. Have a look at the pictures below! An important part of our approach to learning is allowing children to set goals for their own learning within the provision here are some quotes from one of our learning walks. "I'm going to make drinks for the mouse and Gruffalo!" The children are then encouraged to reflect on their learning the next week.
" I made lemonade. now i'm going to make a house for them on the making table". "I'm going to make Gruffalo Crumble and a drink in the mud kitchen!" "I made Gruffalo Crumble, now I'm going to make a house in the big blocks!" "I made Gruffalo crumble now I'm going to make a house in the big blocks"
This week the children have continued their enquiries into the text 'The Gruffalo'. 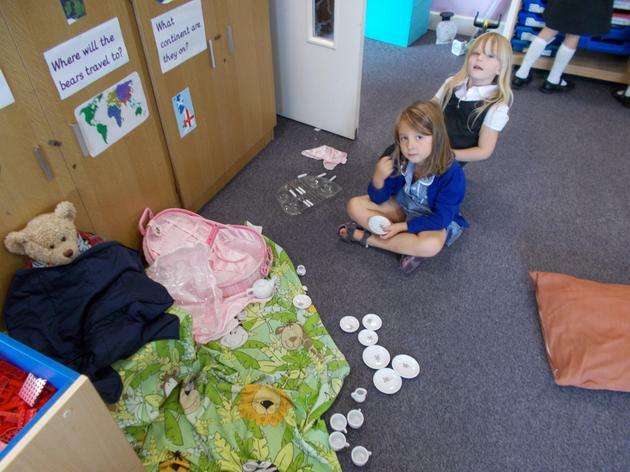 The children have been using their interests and resources to build many different things from the story. Have a look below to see just some of the wonderful creations. We have also got a lovely sensory garden for the children to explore and watch change over time! 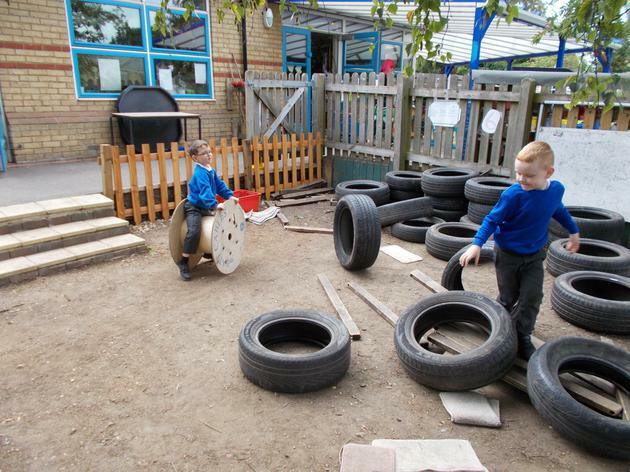 This week we have added even more challenges to the learning environments to support the children in their learning. This week we have introduced our new text! The Gruffalo by Julia Donaldson! Take a look at some of the challenges below. This week the children have continued completing their challenges in the provision indoors and outdoors. 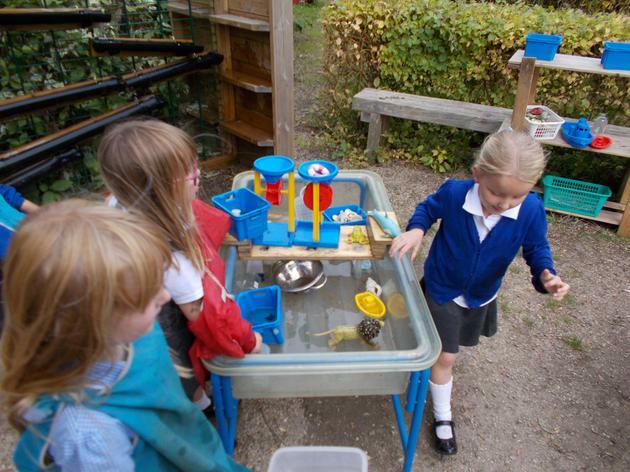 They have also had forest school sessions linked to their text of 'How to catch a star'. The year one children have also learnt the story and added actions to it and shared this with their parents and peers. The reception children have used their forest school skills of lopping to catch a star! "I have enjoyed learning about how I can use the book to help my my own version of it"
" I have enjoyed learning some actions to help me retell the story"
" I have enjoyed changing the characters and ways of catching a star"
Some of the children have been changing elements of the story to make their own. Look at the wonderful creations below. This week we have introduced the book 'How to catch a star' by Oliver Jeffers. Listen to the story below! The children have also been left some challenges to support their learning! This week marks the end of our time using 'The lighthouse keeper's lunch' as a key text. Here are some of the last challenges that were left for the children.
" I'm going to make a seagull trap!" "I'm going to make a house for Hamish"
"I'm going to write my own story!" "I'm going to use the loose parts to build a lighthouse!" This week the children have been completing challenges that have been left by Mr Grinling! Take a look at some below! The children also carry out a learning walk each week to help challenge them in their learning. Here is what some of the children said! "I'm going to make a chocolate cake in the mud kitchen"
"I'm going to make a story in the lighthouse area with my friends"
"I'm going to make house for Hamish in the big block area!" This week we have welcomed the children back into school. We have heard a new Lighthouse keepers lunch story which is continuing to inspire our outdoor learning. We have been aiming high and persevering to achieve the challenges we have created for ourselves. This week we have been looking at our growth mindset. We all aim to persevere, aim high, build resilience, work as a team and we never give up. The children in Yr R and Yr 1 always try to show off these qualities in their work so we are proudly displaying moments that the qualities have been spotted in the environment. This week Mrs Steven's has created a wonderful display showing some of the wonderful learning that has happened this term so far. This week the children have been using the resources in the environment to create models of the lighthouse. They have also been working hard to solve problems such as transporting the lunchbox from one building to another! Excellent team work happening across the classes. This week we have begun to use The lighthouse keeper's lunch as inspiration for our learning. During one of our forest school lessons we used the skill of foraging to collect materials to help us build a nest. we worked as a team to build the nest that will help keep those pesky seagulls away! please find a video of the story below. Uploaded by Kinder Stories on 2018-11-07. This week the children have been continuing to explore their 'Dear Zoo' text. The year ones have been creating stop animations based on the book and Reception have been measuring animals. We have also began to introduce our new book! Can you guess what it could be? This week we have been working on our enquiry of Dear Zoo. Look below to see some of our work! This week the children have been using the book Dear Zoo to inspire their independent learning. Sweeping the leaves to make a bed for the animals. Making a trike track for the animals to play in. This week we introduced the children to their first focus text for this half term. The text is Dear Zoo by Rod Campbell. The children were all given passports to track the activities that they completed during the day. Children were able to bake biscuits, make bracelets, craft masks and even build zoo's in the outdoor area. Look at the pictures below to see the amazing day we had! This week we have reviewed our learning walks from last week and we now have a lovely display that shows all of the fantastic learning that has been happening within the learning environments. This week the children have been continuing with their investigations of 'Not a Box'. 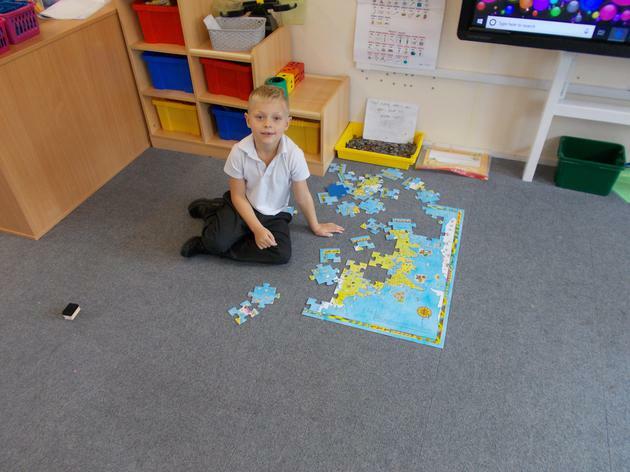 The children have all been leading their learning in the classroom environments. The year one children have also been introduced to the lanyard challenge system where they have to complete adult directed challenges throughout the day. The children have been very excited to have these introduced! This week we have introduced our focus text 'Not A Box'. The children have been actively involved in voicing their ideas about how we could use our environments through the use of learning walks. This week all children in Reception, Year One and Year Two all had a forest school session with a focus of foraging. This week we celebrated Roald Dahl day. The children used the learning space to do the following. 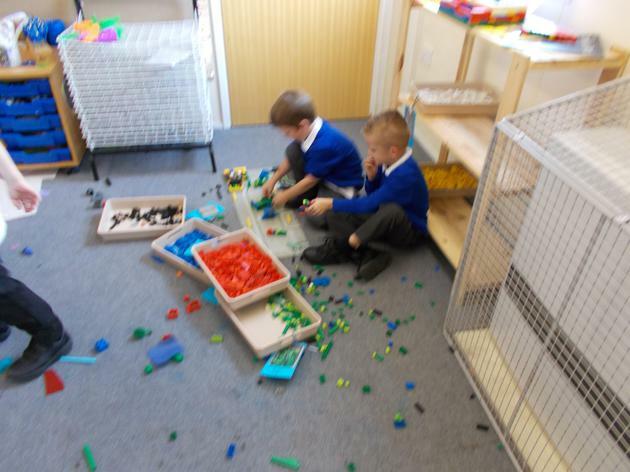 Create a chocolate factory in the big blocks, loose parts and den building areas. Create a chocolate factory in the small blocks. Create a machine to help the chocolate factory with the lego and mobilo. 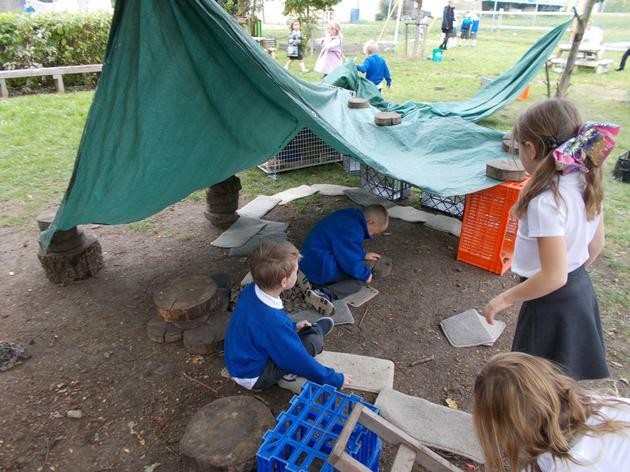 This week the children have been exploring the new resources and new environments that are on offer to them this year. We are really looking forward to starting our first topic and can't wait to see how the children use their environment to support their learning.